This was the movie that introduced the world to the devilish genius of the former video library clerk, Quentin Tarantino. 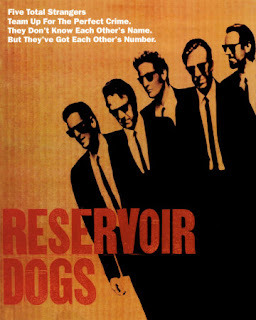 And the fact that the Reservoir Dogs is an exceedingly fresh and original story that creeps under your skin right from the very first shot comprising of criminals, psychopaths, and masterminds, sitting in a café and discussing about something as inane as whether tips are necessary, is enough to convince you that you are onto something special. And then when you end up watching a crime thriller which doesn’t show the crime in the first place but what happens before and after it, told in no particular order, you realize that you have entered the quirky, mesmerizing world of Mr. Tarantino. The ensemble cast, as in his next feature Pulp Fiction, is unforgettable, comprising of such brilliant character actors like Harvey Keitel, Steve Buscemi, Michael Madsen, Tim Roth, and of course, the eccentric Tarantino himself. Every single Tarantino signature is there – unbelievably cool dialogues that can be so misleading for the uninitiated, deliberately bizarre plot twists, a wacky sense of humour, graphic violence and profanity, and a visual experience that is so captivating that it lingers with you for a very long time. Yea, this is still a great one, and it's easy to see why it propelled Tarantino into the spotlight. I appreciate that you're mostly tackling more well-known films here, but I'd like to see your thoughts on, for example, the underappreciated Jackie Brown. And on another note, maybe it's just me, but the color scheme here is very difficult to read. The black on red is really taxing on the eyes. Now there's your classic Tarantino. What a beginning. What an ending. @Ed - Well, honestly speaking, i'm covering movies that i have liked. Its a coincidence i guess that some of those films are well-known. But i'm sure if you go through all the movies i've reviewed (or will review in future) you'll find some which are not as universally well known as the others. But thanks for your suggestion. I found Jackie Brown a decent movie though not as explosive. I'll have a go at it. As for the colour, i've gone back to my old format of black on white. The red one was appealing, but this one is more elegant. @Joseph - I couldn't agree with you more, dude. This one is vintage Tarantino.